How Do You Grout Tiles? Its highly important to have a strong understanding of how to grout tiles before starting out on your tiling project. After all, the most expensive, pristine and unique tiles can be ruined when they’re grouted in an improper fashion. Want to add a colourful splashback to your kitchen? Looking to lay tile on your bathroom floor? Its essential you know how to mix tile grout, so you can seal the tiles in place properly to protect them from moisture and dirt. Happily, grout is simple and quick to apply and by reading our easy step-by-step guide on how to do grouting, youll achieve a professional finish effectively, in no time at all. Here at UK Pro Tiling Training, were experts when it comes to how to grout tiles. Have a look at the following advice about applying grout to tiles for a professional finish. 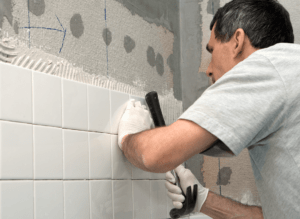 When it comes to understanding how to grout tiles, grouting tiles is the same no matter what type of tile you’re using and whether you are deciphering how to tile a wall or a floor. 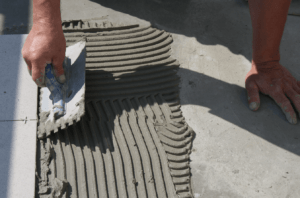 You can buy grout that arrives in powder form and mix it with water yourself or you may want to buy grout thats pre-mixed and immediately ready to use. Whatever type of grout you choose, be sure you have got enough grout to complete the job. Of course, you will need to use a waterproof grout in areas where its possible for water to get onto the tiles, however, so long as you ensure the joints between the tiles are filled thoroughly, your grout will sufficiently hold the tiles in place, whether you’re using ceramic, porcelain, natural stone tiles or another tile material. Its important to know how to mix tile grout. If you are using powdered grout, pour a small amount of water into a bucket. Then use a stick to stir it, making sure you continue adding the grout and stirring until you achieve a consistency that resembles whipped ice cream. When it comes to how to apply tile grout to a wall, firstly, apply a minimum amount of grout to the front surface of the tiles with a trowel and spread it with a grout spreader. The best technique to use is to adopt long strokes that have an upwards and diagonal direction, making sure it spreads completely in between the joints of your tiles. Its important you aim to grout all the tile joints as fast as possible, as the grout will start to harden on application. TOP TIP: Avoid adding water to make the grout spread easily as it weakens the grouting. Once you have grouted all the tiles, wipe the tiles with a damp sponge or cloth to remove any excess grout, being careful not to wipe over the grout in the joints. Hard grout will be difficult to remove. Once you have removed the excess grout and all the tiles are grouted in place, you can finish off the joints between the tiles by using a grout shaper. TOP TIP: The best method to adopt when using a grout scraper is to pull the grout shaper over the joints in one long movement. If you notice any small gaps become apparent in the joints, simply press in a small amount of extra grout with the end of your finger. Again, any excess grout will need to be wiped off with a damp sponge. In addition, a damp, soft cloth with wipe off any marks from where your grout has dried for a perfect, and professional, finish. Replacing old grout can instantly make tiles look as good as new, as grout can often become stained due to excess water and soaps in bathrooms, and food spillages etc. in the kitchen. Minor stains and bacterial growth can be removed using a grout cleaner. However, tougher stains and seriously worn grout will probably need replacing. You can replace old grout by scraping out your existing grout with a grout rake, first working vertically, followed by working horizontally. Be careful not to scratch your tiles. Make sure you remove all the grout, and then replace it with new grout, following the steps on how to grout tiles above if you are unsure of how to use grout. Whether you want to know how to apply tile grout professionally, how to repair a cracked tile, how to tile with metro tiles or are just curious about how to maximise your earnings as a tiler, be sure to check out our handy how to guides on our website, which cover a wide range of topics. And keep an eye on our blog for more must-know tips and tricks when it comes to tiling. Discover all sorts of topics, including how do you mix grout to guides on multi-coloured wall tiles.